The Rt. Hon. The Lord Mayor, Alderman David Wootton, examines the role, contribution and connections of the City and business - fundamental elements of our community. This is the 2012 Lord Mayor&apos;s Annual Gresham Lecture. 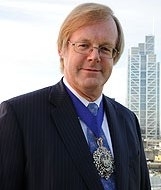 The Rt Hon David Wootton was the 684th Lord Mayor of London. He is a partner in Allen & Overy, President of the Society of Young Freemen and Hon. Vice President of the City Livery Club, as well as holding a host of other positions in a wide range of charitable and other organisations. Ladies and Gentlemen, I am delighted to welcome you to Guildhall – a building which has stood at the heart of the City’s commitment to commerce, charity and community for 600 years. Guildhall embodies the unique heritage, diversity and leadership of the City of London. It is, therefore, a great backdrop for my talk – ‘What has the City ever done for us?’ I have no doubt that the Python fans out there among you will recognize instantly my tribute to that immortal line ‘What have the Romans ever done for us?’ – uttered by the great John Cleese in ‘The Life of Brian’. We are all familiar with the ironic humour of this skit.....the People’s Front of Judea are irked to have their pithy slogan thrown off course by trifling little details of what the Romans actually had done......such as sanitation, medicine, education, public order, irrigation, roads, a fresh water system and public health. Now, it is right and proper that any authority should be considered in this way – what have they ever done for us? Only then can we ensure that an authority’s objectives – and outcomes – remain on course. And that it remains strong and sustainable for the future. The City has certainly not endured for so many hundreds of years, by sticking its head in the sand. Or by running a system which benefits very few, and leaves the rest by the wayside. Or by refusing to evolve and adapt to best serve the needs of its communities. Ladies and Gentlemen, none of those things are good business sense. The word ‘sustainability’ is over-used – but there are times when it is impossible to avoid it. And this is one of those times. The City cannot be strong, and it cannot be successful, without being sustainable. This means building healthy communities, and supporting those most in need. In the bicentennial year of Charles Dickens – and, as a Lord Mayor who is also Chairman of the Charles Dickens Museum in Bloomsbury – I note that one of Dickens’ central themes is the connection between every member and every level of society – especially the responsibility of the ‘haves’ to the ‘have-nots’. Times have changed, but this message is just as important today. The City knows its responsibilities and its vital connections – to industry, to those in need and to our nation. As Lord Mayor, I am fulfilling the role of the ‘front man’…the man on stage. But if I do well, it is only because I can call on the goodwill and support of so many. I agreed. The City has taken a battering from the media in recent times. The flames of public outrage at perceived inequalities and errors, have been ignited and fanned. And yet, I know that there is no shortage of excellent work on which to ‘shine a light’. The City has a very, very long history of philanthropy – married with commercial activity. For example, the City of London Corporation established and supports academies in Islington, Southwark and Hackney – with multi-million pound gifts. Enabling children from some of the most deprived communities in the UK, to benefit from a first-class education, and the support needed to achieve success. And, over the past 15 years, the Corporation’s charity, the ‘City Bridge Trust’, has given grants of £1/4 billion to charities across Greater London. These charities are small, grass-roots organizations, which serve very specific needs. For example, the “Fear and Fashion” partnership – initiated by The Trust to tackle increasing knife crime in London, and supported with a £1 million investment. Soon after the project began, a teenager from one of the participating schools was stabbed and killed. One of his best friends, considering revenge, was counselled against this downward spiral by a project leader. He was encouraged and helped to progress in sport and, as a result, now represents Great Britain in Judo. The Trust has also given over £100,000 to fund the “Coping Through Football” project, which improves physical and social well-being for those with mental health needs. Almost all participants who were previously drug and alcohol dependent, have been helped to get clean. And almost half of participants are now in education, employment or training. The Trust’s seed-corn funding is the targetted, practical support which is often needed most. Our City Livery companies also operate in this way – with targetted gifts, designed to serve specific needs – for a sustained period of time. And make a real difference for the future. The Building Crafts College in Newham, supported by the Carpenters’ Livery Company, is providing skills, aspiration and hope to young people from a community with high unemployment. The skills they gain will help build up this community and contribute to the Thames Gateway regeneration for decades to come. In 1907, Lord Mayor William Treloar founded an Appeal for children with non-pulmonary tuberculosis – building a hospital and school with support from the Livery. Over 100 years later, ‘Treloars’ is one of the most advanced, specialist schools for disabled children in the world – and its enormous costs are still met with significant help from the Livery. Then, as now, the Livery has the ‘fleetness of foot’ and sheer gumption to use its resources to tackle some of the most difficult challenges facing our society. This year, I have seen many projects spring up in support of young people and sport – spurred on by the London 2012 Olympic and Paralympic Games. I hope these initiatives will be part of a lasting legacy beyond the Games – inspiring and investing in many more young sportsmen and women. But I also have real admiration for those who invested in the years building up to the Games – such as the Great 12 Livery Companies, who have identified and supported promising young athletes for many years. In one instance, just providing the petrol money, enabled an aspiring hurdler to make the weekly trip to the best trainer in the country. Another beneficiary said “With the support I have been given, this is the first time in my life that I can afford to eat the way my coach wants me to”. This sort of intervention may not even occur to many of us. But thanks to those who are using their particular knowledge of particular needs – making their giving as effective as possible, and enhancing monetary gifts with practical action – we are seeing real results. In this instance, several athletes made such startling progress that they have either qualified for, or are on the edge of, the British team. The Livery are an enormous force for good – a responsibility borne for hundreds of years. They are the living embodiment of connections in the City. Championing their professions, trades and crafts – often with roots deep into the regions – and forming a network across every sector of business and the City. And they do a huge amount to support people into education, employment and training, as well as initiating and funding a broad spectrum of charitable projects. I could spend the entire day listing their many successes. And the many ways in which we have all benefited from their quiet, yet immensely powerful, support! City businesses also do an enormous amount to support and invest in their communities –through funding and, more importantly, through an invaluable contribution of their business skills and talent. This attitude is integral to City business. The concept of reinvestment in community, is not a new one – although it may be rebranded and badged as such. Since the very origins of the City trades, there has been ‘social investment’ through apprenticeships, education, charitable donations – all helping to improve the health of a business’s community and, therefore, the longevity of the business itself. Over the past 20 years, the concept of ‘corporate social responsibility’, ‘CSR’, ‘social investment’ – or whatever they’re calling it at present! – has brought together and progressed many different strands of business engagement. The private sector has made a huge contribution to economic and social regeneration in the City, and its neighbouring boroughs – at the initiative of the private sector itself. Just looking at the contribution made by business members of the City of London Corporation’s CSR programmes – I know that thousands of volunteers from City businesses are supporting hundreds of community organizations…....tackling homelessness....unemployment...... literacy.....mental health......discrimination.....and disability. These are just the businesses signed up to the Corporation’s programmes – there are many more who carry out excellent, indepth CSR programmes of their own. As a long-serving partner of Allen & Overy, I know that this is certainly something that my firm has prioritized. And I know, first hand, the enormous benefits of investing in communities, employees and the environment. Our ‘Smart Start’ programme runs workshops and challenges for young people from disadvantaged communities – providing an insight into the world of work, and providing essential business and lifeskills. We want to show them that they are the City workers of the future – and remove obstacles in the path to their chosen career. Business knows that this is not just an investment in the health, growth and future, of their own business.....but also an important contribution to the wider economy, and wider society. And, as any successful businessperson knows, truly sustainable investment – that word again! – is cyclical. If we do not build strong, healthy communities – we will not have the pool of talent which we rely upon to keep our City, and Nation, strong…and create the stability and prosperity to build even stronger, healthier communities. I recently visited the Hoxton Apprentice restaurant in Hackney – an excellent example of a social enterprise. In recent times, charities and social organizations have become more sophisticated and sustainable in their approach. Years ago, our heartstrings were tugged by images or descriptions of a particular need – and we dug deep, gave money to the cause...and continued with our lives. Nowadays, the third sector is exploring new ways to fund its work – and tackle issues for the long-term. Not just by resolving immediate needs – but also by taking an ‘holistic’ approach, in order to tackle and resolve the cause of those needs. Social enterprises combine business and charity.......for the benefit of both. Hoxton Apprentice, managed by ‘Training for Life’, is an exemplar social enterprise – innovative and commercially viable. Training and work-experience is provided to the long-term unemployed – while top-notch food is provided to paying customers! The restaurant has been a huge success, and profits are re-invested to fund the training programmes. Earlier this year, we celebrated the launch of a new property investment fund to support the work done by London’s leading homeless charity, Broadway, to help rough-sleepers find permanent accommodation. Private landlords lease to the charity properties for sub-lets to the homeless – and the private sector is now contributing further through the new fund, which will purchase hundreds of flats for Broadway’s ‘Real Lettings’ – an excellent example of social investment – and an effective relationship between the private and third sectors, to meet an urgent community need. A very different set of affairs to those experienced by one chap who found himself in reduced circumstances some centuries ago... After a number of nights under the stars, he happened upon a roadside inn with a sign reading: ‘George and the DRAGON’. He knocked. The Innkeeper’s wife stuck her head out of a window. “Could ye spare some victuals?”, he asked. The woman glanced at his shabby, dirty clothes. “No! Clear off!” she shouted. “No! Just get lost!” she shouted again. “What NOW?” screeched the woman, not allowing him to finish. The City of London’s crest unites the cross of St George and the Dragon – a reminder of the legend and the role of the City, to protect and to serve. And each year, the Lord Mayor’s Dragon Awards recognize some of the best community projects, carried out by City businesses. ...Remember that the City IS a social enterprise. I’ve often been asked by people in the City to draw attention to our good works – but, in my humble opinion, we should start the other way around. As Lord Mayor, I am not in the business of ‘off-setting’ what is sometimes perceived as the ‘murky and mysterious world of the City’, by imploring you to consider all the very good work it funds – and, therefore, judge the City more kindly. No – I am inviting you instead to have a right and better appreciation of what the City IS. In recent times, we have seen great suspicion about the role of business. There is a running argument between financial stability at one end of the spectrum, and jobs and growth at the other. But the two are NOT mutually-exclusive. The City is crucial for our future prosperity. I often hear the suggestion that Britain’s economy must rebalance, implying that the City and financial services, at one end of the seesaw, must move down for other sectors to move up. But this is not a zero sum game: one depends on the other. We must continue to diversify our economy, so that we grow all sectors. We cannot create jobs and we cannot create growth in the wider economy without finance, and without capital. And we will not have finance or capital, without the City of London. As Lord Mayor, I will travel to almost 30 countries this year – championing UK financial, professional and business services – the City brand. I lead a delegation of British business leaders to each country – helping them to secure new contracts for infrastructure and exports, and facilitating investment into the UK. This will create jobs and growth here in the UK – and strengthen the global economy. But the City is not focussed on international markets, to the exclusion of domestic ones. Because the City is not just the square mile. It is the whole of financial and professional services – almost 2 million jobs – across the UK. The series of satellite centres for finance in the regions – hubs of business which serve, and are served by, the City of London itself. When I led a business visit to Wales last year, I was struck by the excellent appreciation there of our interdependence for mutual growth. A job in London is not seen in Cardiff as being at the expense of a job there. It is more likely to mean an additional job in Cardiff. There is a strong perception that, if we do well, they do well. And if they do well, we will do well. A strong City means more opportunities for investment, more jobs and more growth, across the UK. This message was reiterated during visits to my home town of Bradford, as well as Manchester, Leeds, Liverpool, the Isle of Man, Belfast, Stoke-on-Trent, and Southampton – in fact, wherever I go in the UK. One of the most senior businesspeople in Belfast told me that the Belfast economy was dependent – his word, dependent – on the City of London’s financial services doing well. And to use Belfast as an example, when Citigroup moved their financial technology group to Northern Ireland four years ago, there were attractive locations available to them outside the UK. However, they recognised the value of remaining in the UK – and remaining plugged into the City’s pool of talent and capital. Citigroup has prospered as a result. Just four years ago, they had 375 employees in Belfast. Now they have 1,500, in both technology and legal compliance – a major contribution to jobs and growth in the area. Wherever I go in the world, the City is held in very high regard. They know the City is the pre-eminent financial centre, with a timezone conducive to international business,…excellent links to Europe and the Middle East….cutting-edge communications infrastructure……a stable regulatory and political environment…..and a rich and diverse talent pool. All positioned within a unique historic and contemporary urban landscape – which attracts people to live and work here, from all over the world. During my recent visit to Canada, our commercial partners there just did not understand the coverage they see here talking the City down. It is our job to talk it up. And this is something I have been doing as much as possible – and through a variety of media! As I said, many people try to justify the importance of the City by giving examples of the volunteering, mentoring and philanthropy it carries out. This is all good stuff – but the argument is facing the wrong way. All these good works are only possible BECAUSE of the wealth-producing sector. BECAUSE of financial services. They are all derivatives of the City. The City is about wealth-creation. And we should celebrate that fact. When did ‘wealth’ become unworthy? We must get away from a subconscious emotion, encouraged by the media, that morality and honesty equates to poverty and penury. Is it not better to generate wealth…generate jobs and growth…which can create a better standard of life for all? We have a common, overriding national and international mission: the creation of prosperity, the creation of economic growth, and the creation of jobs – jobs that provide security for our fellow citizens and stability for our communities. We live in a society which is accustomed to certain basic necessities, which some countries would deem luxuries. We benefit from education, infrastructure and healthcare which is among the best in the world. And we expect nothing less than the best. But how do we expect to pay for it? How else do we expect to provide every individual, regardless of background, with access to the education, infrastructure and healthcare which will enable them to achieve success in their lives? Let us not buy-in to the myth of ‘morality means poverty’. We often hear people advocating a more ‘simple’ life – but is that really what they want? Over the past 40 years, infant mortality rates have decreased by three quarters. Meanwhile, a far greater number of people have access to education & training than ever before. Let us accept that we have an expectation about lifestyles. My point is that we cannot then disassociate where that lifestyle comes from. We cannot avoid ‘economics’, and still enjoy good things. There has been a great deal of scrutiny of the City – rather more than the role of Government, regulators or indeed ordinary citizens. Part of the reason is that the City is easy to blame, and provides a good distraction from fault elsewhere. While executive pay can create problems and inequalities, it did not cause the crisis. And this issue is being addressed by shareholders, responding to public concern by ensuring remuneration is linked to long-term success, not short-term gain. The next step is not to abolish the City, or treat banks as arms of the Civil service. This is a blinkered view of what the City exists to do. A properly-calibrated, well-judged risk is the essence of any sound business decision. It is the City, and the UK’s financial, professional and business services, which makes public services possible. Financial services create wealth. And wealth is the water which creates growth. Makes possible our public services. And creates jobs across our economy – from the manufacturing sector to maritime services. Proper and prudent management of the public finances is itself an essential precondition for a successful market economy – and increasing public expenditure will not lead, of itself, to growth and jobs, but it certainly means a continuing and an unsustainable public debt. Growth will come from private sector enterprise, innovation and energy – supported by Government measures to provide the stability, clarity and predictability that business must have. I recently visited Stoke-on-Trent – a good example of entrepreneurship, achieving real growth. The Potteries are crucial to employment in the area – and, through their large and increasing export orders, are also making an important contribution to the wider UK economy. I met the leaders of 10 Potteries and heard that their sector would benefit hugely from an ‘Origin Mark’ – recognizing and increasing the value of their products, and desirable for international consumers. The Government needs to create regulations which will make and keep business competitive. Throughout the UK I have seen innovative, world-beating businesses – big, small, export-based, with excellent products, staff, market penetration – and no difficulty in getting funding. As Lord Mayor, I am an ambassador for all UK business – and I spend a great deal of time promoting UK expertise in technology, engineering, design, creative industries, project management – as well as financing – and all UK manufacturing. After all, we are the 6th largest manufacturing country by value in the world – and this industry has great importance for our success. As do financial and professional services. There will always be a need for bankers to provide capital, for accountants to monitor it and for insurers to keep it safe. Ladies and Gentlemen, as I said earlier, we all hear the word ‘sustainability’ until it begins to lack weight or meaning. But don’t underestimate the importance of true sustainability. True long-termist, responsible, effective, action and investment. Not just handing something on, but making it better. This is the role of the City. This is what the City has done well for hundreds of years. And this is what the City does well because it has done it for hundreds of years. I am relieved, pleased and proud that we do not have a City which has been cowed by every mood and fad of the day. Instead, the City has embraced and nurtured a rich diversity of business services – a unique cluster – by building on its long experience and expertise. The Livery Companies are a microcosm of the City. They are not involved directly in manufacturing, but they make important and valuable contributions to the manufacturing sector – through investment in their trades and crafts. Crucially, through bursaries, apprenticeships and award-schemes – which ensure that these skills are preserved and passed on for the future. This long-termism, whereby funding is maximised through mentoring and other practical, ‘hands-on’ support, is sowing a seed for the future. I am delighted that the Livery was at the heart of celebrations of Her Majesty’s Diamond Jubilee – out in force at the lunch for Her Majesty at Westminster Hall. 85 Liveries were represented, and 530 of the guests – four fifths of everyone there – were members of the charities, schools, trades, crafts and uniformed services which the Livery supports. What a testament to the priorities and meaning of the Livery. With roots in medieval times, the Livery - the Guilds - have nurtured their industries through education, training and mentoring. So too does the City follow long-term business prospects. This approach may be the reason that the City does not always get its message across. We should not chase headlines, or devote ourselves to short-term popularity – but build on what has gone before in order to achieve a better future. Our City is, and has always been, a world-leader. Thanks to the Lloyds Insurance Market, the Baltic Exchange, the London Stock Exchange and other, unique institutions – this is where the world comes to do business. And our competitive advantage was increased by the opening of the new Commercial Court last year – the largest and best-equipped business court in the world. This was one of the most important events for London and the UK, in recent history. The Court reinforces the UK’s world-leading legal services sector, and the City’s position as the foremost global centre for financial, professional and business services. And I have seen, first hand, how highly-regarded the Court is across the world. I am incredibly proud of everything our City has achieved, and everything our City stands for. Our stock stands high across the world. We simply cannot afford to hamper our competitiveness. And we must be able to make bold, responsible decisions, for future benefit. We cannot blow on the breezes of discontent – making sweeping, indiscriminate decisions to slap one wrist and risk felling many by “straight-jacketing” our competitive advantage. What will we achieve by taking something away from those we perceive to have too much? We could give it all away – but when it has gone, where do we get more from? The Olympic torch – currently on its journey around the UK – is passed on with pride from one carrier to another. From one Olympic Nation to another. But this is preservation, not sustainability. We, the City, are in the business of building on what has gone before. In order to preserve the best of the past, while ensuring a stable and secure future. A lot of people think that the City is about short-term gain, over long-term benefit. But no one has a monopoly on the concept of sustainability. The City is a vital part of our ‘economic ecosystem’ – funding the infrastructure at the heart of our communities – from hospitals to homes. We are producing better medical care, better maternity care, better quality of life. This is sustainability. Indeed the eminent Gresham College, its professors and affiliated academics, and its prestigious lecture series – for the public benefit for over 400 years – was made possible by a former Lord Mayor, Sir Richard Gresham. He had the vision to build an Exchange in London to rival the Antwerp Bourse – a vision realized by his son, Sir Thomas Gresham. The Royal Exchange was built in the C16th and Sir Thomas appointed Royal Agent in Antwerp. His Mansion in Bishopsgate was the first home of the eponymous Gresham College – whose Professors’ salaries were met by the rental income from shops around the Royal Exchange.... ...bequeathed, by Sir Thomas, to the City of London Corporation and the Mercers’ Company. Gresham’s sustained and sustainable investment not only created an Exchange which helped maintain and enhance the City, and the UK, as the pre-eminent hub for trade and industry….but also founded and supported a College which would nurture and disseminate knowledge and expertise – for the edification and continued development of our City. This is the sort of investment where it is impossible to measure the return. And yet the return is priceless. Sir Thomas, like so many of the ‘City fathers’, was playing the long game. He knew that the City would endure and excel, only with a ready stock of informed and informative individuals – replenishing the City’s businesses and public services with a rich pool of talent, envied all over the world. And this is indeed the case today. Due to the many City institutions and educational establishments, founded and supported by City philanthropists, businesses and Livery companies – in order to create a healthy, sustainable City......at the centre of our Nation’s cultural life. The City’s Universities and Academies, the Barbican, the Guildhall School of Music and Drama, the Museum of London, the London Symphony Orchestra, Hampstead Heath, Epping Forest, and many other green spaces...make our City a hub for the creative industries and a very desirable place to live, study and work. As I said at the beginning, I am greatly enjoying the chance to have my year on the stage as Lord Mayor – and the chance to champion the City’s cause, for the benefit of us all. And I am very relieved that today, I did not meet the same fate as someone else who recently gave a 45 minute lecture. Unfortunately for him, he was preceded immediately by me – with a few opening remarks on dispute resolution. I spoke for a short while and promptly hopped off the stage, gathering up my script as I left. The keynote speaker, a senior associate from Allen & Overy, then gave his lengthy address – to great acclaim. Only afterwards did I realize that, in my haste, I had swept up his speech as well as my own – and he had delivered his lecture entirely without notes! I am very glad he did not persuade the honourable Gresham staff to return the favour today – as I fear you would have been less convinced and complimentary than his audience! Thank you all for coming to listen to the 2012 Lord Mayor’s Gresham Lecture, here in Guildhall, and I hope you have enjoyed this event as much as I have enjoyed reflecting on the role, contribution and connections of our great City.